"Glenmalure stretches from the 'first meeting of the waters' to the base of the Table Mountain, a distance of about twelve miles. 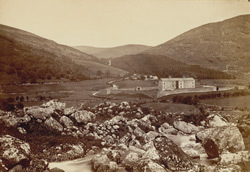 It is traversed its entire length by the Avonbeg river, which, originating in some mountain spring on the side of the Table Mountain, after a short and hurried course, throws its little stream over a ledge of rock called the Essfall; meandering through Glenmalure, it receives the numerous rills which are sent down the mountain sides, and at length mingles its collected waters with those of the Avonmore, under the woods of Castle Howard. The character of this Glen is altogether different from the picturesque beauty of the wooded Dargle, or the softer features of the Glen of the Downs; its aspect is wild and impressive, the rude and barren rocks, which rise abruptly on either hand, giving a savage grandeur to the scene...Except the passes for some distance on either side, along which the military road is carried, the continuous lines of mountain on either hand rise boldly from the Glen to an average height of 600 feet, and their precipitous sides are unbroken, save by the ravines and chasms formed by the numerous rills which for ages they have sent down to the plain."